Some people don’t like doctrinal statements, viewing them as a tool of oppression and exclusion. 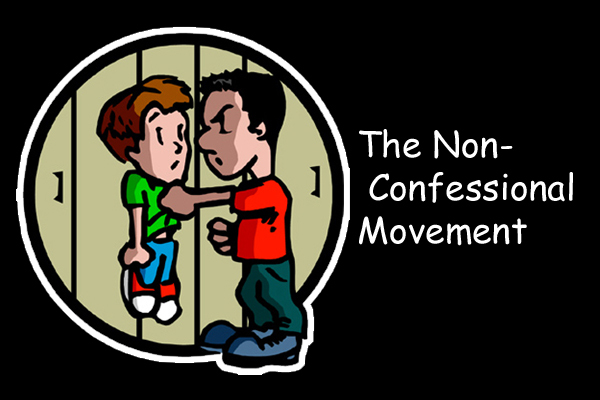 They would much rather be “non-confessional” (meaning: doctrinal agreement is optional, as long as people play nice). Unfortunately, non-confessional movements usually end up looking like the picture at the top of this post. Throughout church history, statements like the Apostles’ Creed, and the Nicene Creed (among others), have served in similar ways, providing a much-needed litmus test so that movements could obey the Scriptural admonition to safeguard the church from doctrinal “alternative facts” (aka heresy). A “Statement of Faith” is vital for straining out doctrinal error, and the New Testament is replete with admonitions to be on guard against false teachings. St. Paul was not the only one to sound the alarm. Similar warnings were voiced by St. John (1 John 4:1), St. Peter (2 Peter 2:1-3), and also Jesus Christ (Matthew 24:10-11). When a movement eschews a statement of faith, preferring instead to be non-confessional, they create an ethos where no teaching can be objectively evaluated, and where “alternative (doctrinal) facts” cannot be challenged. Without the objective standard of a Statement of Faith, the direction of a movement will rest in the hands of those with the most political power. Appeals to Scripture or the history of Christian orthodoxy will fall on deaf ears. “Alternative (doctrinal) facts” can now flourish freely. Anyone holding to a confessional approach can then be effectively ridiculed and silenced, usually by caricatures, shout-downs, and zinger-ology (I’ve written about these tactics before). Doctrinal questions and debates are settled by whomever can generate the loudest echo chamber, bolstered by the largest number of “likes” and retweets.